To kickf the 2018-19 NBA season, Philips Arena is set to be bigger and better than ever. On Wednesday August 15th, the Atlanta Hawks hosted a special event to show a few their supports and fans just what they have in store. During the Atlanta Hawks Basketball Club’s 2018-19 Preview Event, the franchise announced key plans regarding the 2018-19 season, the future their business and the transformation Philips Arena. Held at Terminal West, Atlanta Hawks Chief Executive Officer Steve Koonin outlined the vision and provided details the following major campaigns. 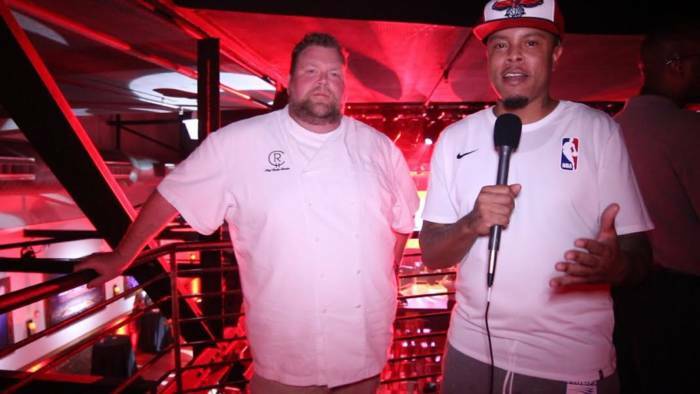 Following the spotlight show where Hawks CEO Steve Koonin revealed the new Hawks Hardwood Classic Jersey’s, the Opening Week schedule and Philips Arena’s new restaurant partners, Terrell Thomas had a moment to speak with the head chef Zac Brown’s Social Club, Chef Rusty Hamlin. Chef Hamlin is no stranger to the big stage or preparing menus for large crowds. For years after country music star Zac Brown would hit the stage on tour across the country, Chef Rusty Hamlin would prepare large menus and dishes for fans during special “Eat and Greets” that Zac Brown has become famous for. During our interview, Chef Hamlin spoke on his journey as a Chef, how his background as a native Louisiana has influenced his menus, what dishes we can expect to see in Philips Arena, his time on the food network and more. The interview was conducted by Terrell Thomas. The interview was shot and edited by Daniel Alves.